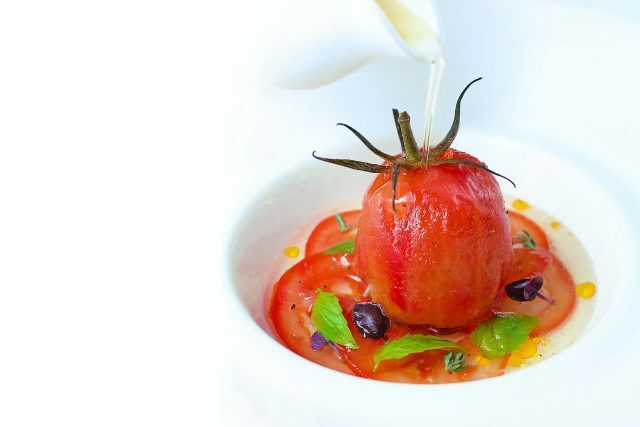 As an increasing number of Brits either shun meat altogether or adopt more of a flexible approach by lowering their intake and during the week and treating themselves at weekends, restaurants are responding to our shifting eating habits by making a hero of humble vegetables and shining a light on them on standalone tasting menus that seek to prove that a meal without meat (or fish) isn’t a meal where you miss out. The likes of Gauthier Soho, Pied à Terre, The Ledbury and Alyn Williams at The Westbury have been pioneering this approach for years with their veggie tasting menus. Gauthier Soho’s current menu features delicious delights like celeriac and apple velouté; wild mushroom tortellini; miso caramelised turnip and quince; and saffon roasted butternut squash. On Pied à Terre’s vegan menu you’ll find experimental dishes like cauliflower with vanilla, sea vegetables, crispy quinoa, kale and tenderstem broccoli; and salt baked heritage beetoot with grilled baby leeks, sorrel and Port. Trendy venues like The Clove Club, Pollen Street Social, Tredwells and The Frog by Adam Handling have also been championing veg by putting it centre stage, rather than treating it as an afterthought. A staple on Adam Handling’s vegetarian menu is his signature celeriac dish, featuring date and lime, and a decadent dish of Tunworth gnocchi, onion and Worcestershire sauce. Jason Atherton meanwhile, serves the likes of new forest mushroom pearl barely with Périgord truffle; and beetroot tartare with apple and sourdough croutons on his vegan menu at Pollen Street Social. Expect to see more restaurants following suit with seriously thought out vegetarian and vegan tasting menus offered alongside standard ones as restaurateurs wake up to the fact that non-meat eaters are becoming an increasingly powerful and influential demographic.